A few words on how to read this graph. The libraries in the middle of the "starshape" are the ones with the most dependencies, each line between the nodes is a dependency. A dependency can be one or multiple files. The graphlayout is not weighted. A short introduction on what you need to get this tool to run. First boost, as this tool is build to analyze boost. I've tested with some versions (1.49 - 1.54) of boost. You also need a version of bcp, which is quite easy to build (b2 tools/bcp). Then you simply need to start the tool, if BOOST_ROOT is set, the tool will try to read it, other wise you will be asked to choose the location of boost when clicking on Read dependencies. Next thing is selecting the location of bcp. That is the setup, and the tool will now run for some time. On my machine its 90 seconds to 2 minutes the analysis takes, it might be lot longer on yours, depending on how much cores you got. The tool will spawn for each boost library (~112) a bcp process, and analyze this output in a thread pool. After this is done, the data is loaded into the tool, and then saved to a SQLITE database, which will be used if you start the tool a second time and select this version of boost. Loading from the database is far faster. To the left are all the boost libraries, the number of dependencies is shown in the braces. To the right is a Tabwidget showing all the dependencies, the graph is layouted with boost graph. When you click on show all you'll get the full view of all dependencies in boost. The layouting is done in the background, so this will take some time to calculate, and is animated when its done. The results of the layouting are good, but not perfect, so that you might have to move some nodes. Exporting supports images, which are transparent PNGs, not all services/tools are happy with that (f.e. facebook, twitter nor G+ could handle the perfectly fine images), this can be fixed by postprocessing the images and adding a white background. I've already written a little about the tools inside, its build with Qt5.1 and boost. Where boost is mostly used for the graph layouting. As I choose to work with Qt5, it has a few more dependencies, for windows this sums up to a 18 mb download, which you'll find at the end. The tool depends on 3 libraries from my company Code Node: ProcessingSink, a small wrapper around QProcess, that allows to just start a bunch of processes, and lets you connect to the finished and error slot. This was necessary, as I could only spawn 62 parallel processes under windows, so this library does take care of spawning the parallel processes now. Which are currently 50 at a time. GraphLayout is the code that wraps the innerworkings of boost::graph, its a bit dirty, but lets me easily process the graphlayouting. 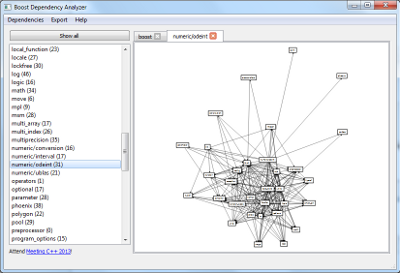 The 3rd library is NodeGraph, which is the Graph UI, based on Qts GraphicsView Framework. I plan to release the tool and its libraries under GPL later on github, for now I don't have the time to polish everything. One of the earliest questions I had when thinking about building such a tool, was where to get a list of the boost libraries? This sounds easy. But I need to have this readable by machine, not human, so HTML is a great format, but I refused to write a parser for this list yet. I talked to some people about this at C++Now, and most agreed, that the second option would be best: maintainers.txt. Thats what the tool reads currently to find the boost libraries. Unfortunately at least lexical_cast is missing in this list. So, the tool isn't perfect yet, while lexical_cast is already patched, I'm not sure if anything else is missing. A candidate could be signals, as its not maintained anymore. Currently the tool analyzes for 1.54 112 libraries.